Living on the San Diego River can be amazing. For a while, it seemed to change every day. It could be dark green and deep, beautiful with a flowing current. Living here gives you a sense of being on a camping vacation every day, just by looking at it. Yet we are still in central San Diego. Since it is a nature preserve, many wild creatures come and go,making the river their home. Some permanent, some temporary.I remember when the river had a murder of crows that nested in a tree, just off our balcony. They would wake us up every morning and greet the sunset near our place every night. They sure did pester us, but it was a lively sign of nature. Then there was the time that a whole family of turtles appeared on the riverbank. There was this huge floating leaf that they nested on the opposite side of the river, and before we knew it, we could see a bunch of baby turtles through our binoculars. With the next rain though, they were gone. Apparently, there are fish in the river too, and even a few hardy souls who kayak there that want to get away from their wife and kids for a few hours for some catch and release fishing, floated their torsos in the boat and their feet in the water when the level was higher. The problem lately, is that not enough rain and too much algae make the river look ugly now. After researching the causes for this, by contacting the San Diego River Park Foundation,River Watch Coordinator, Shannon Quigley Raymond, I found out that basically this is due to a lack of rain. Rainfall has been very low this autumn and the river foundation has decided to not introduce any chemicals to reduce algae and just let nature take its course. Nutrient level aren’t particularly high and there are no increased phosphate or nitrate levels either. However, there are high levels of conductivity which the River Watch is concerned about. It doesn’t look pretty, and if the housing market wasn’t so tight, it might affect property values. Supposedly, the River Park Foundation hasn’t concluded that this is due to climate change or an inordinate amount of pollution from any unusual source as the water quality chart below indicates. The algae also increases the amount of mosquitoes that affect local residents. We had to install a screen door to keep from being bitten. Mosquito Abatement flies helicopters with insecticide that Raymond of the River Watch claims are not harmful to humans. After contacting, the county water department, http://www.sandiego.gov/water, the San Diego Environmental Health Department,http://www.sdcounty.ca.gov/deh/about/contact.html and Andrew Hughan of the Department of Fish and Wildlife, http://www.dfg.ca.gov/news/contact.html, Raymond of the River Watch was the most helpful and knowledgeable. If anyone is concerned about the algae and the river’s water quality, and wants to volunteer, the San Diego River Foundation River Watch is having a river monitoring meeting, Sunday, Nov. 17 at 8AM at 4891 Pacific Highway #114, San Diego, 92110. LSDR (12 mo) Running Avg. water quality conditions for this season of the year. oxygen levels improved from last month by 20% to comparable to last Oct. and the 9-yr averages. Streamflows are also up significantly from last month but still below last Oct. and the 9-yr.
remaining in the Poor range, over the past 30 days. 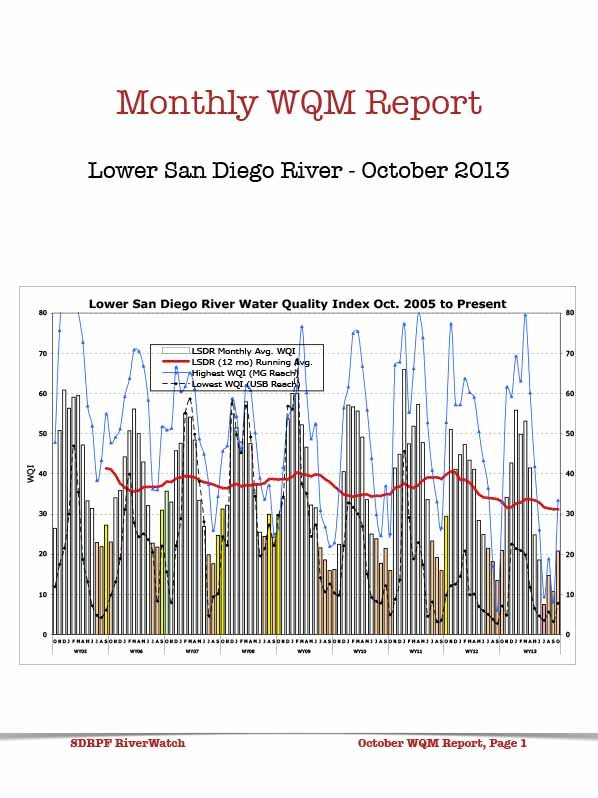 WQI expected to increase over the next month at most monitoring sites. MG section of the river exhibited best overall quality. patterns and trends over the past 9 years are evident. running average value since the monitoring effort began in 2004.
expected to improve somewhat next month as flows increase and waters continue to reoxygenate.